Peacefully perched along the sought-after west coast of Barbados is the incredible 3 bedroom villa, Footprints Cottage. This Caribbean vacation rental is located in St James on the West Coast of the Island and indulges in the serene area of Alleyne’s Bay. Based in a quiet location, this modern villa is a short walk from Alleyne’s Bay Beach and is within range of the islands’ many lovely beaches. 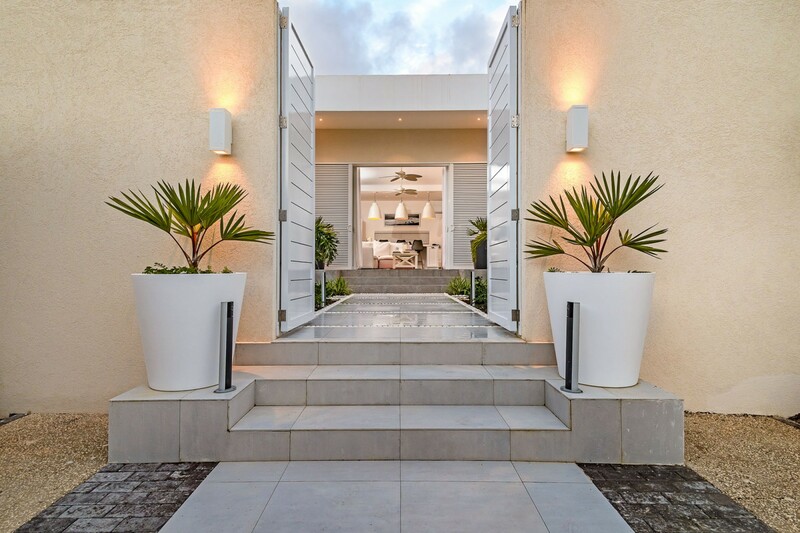 Just a minute’s stroll from the delicious and famous ‘Lonestar’ restaurant and a short five-minute drive to Holetown, the property has access to a profusion of amenities. The villa can accommodate up to six guests comfortably over the spacious interior and exterior living space. 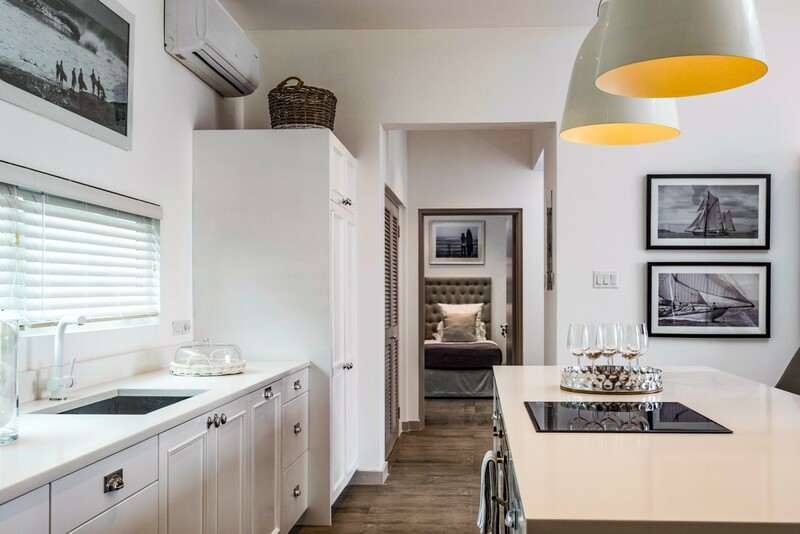 Footprints Cottage is a newly built luxury villa that encompasses top-class amenities and features to cater to each and every one of your needs. The villa itself is gated and secured through the entrance. With an enclosed courtyard the property offers complete privacy and serenity from the outside world. 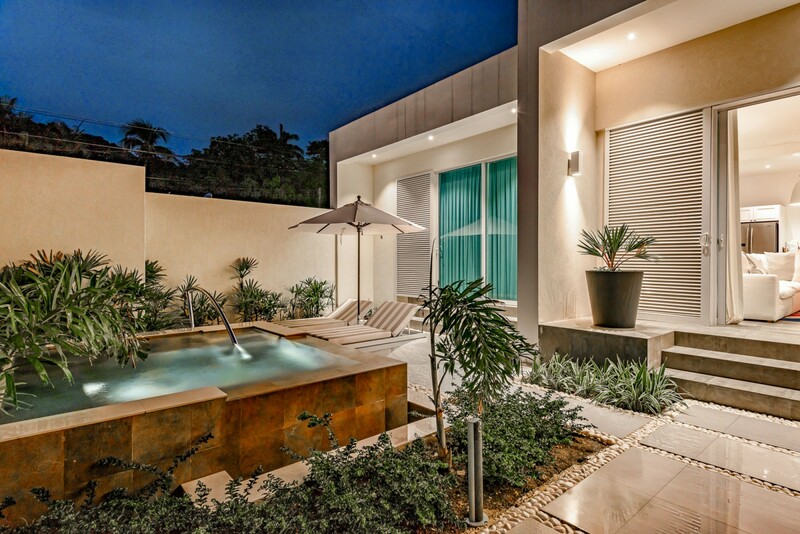 The courtyard features lots of tropical plants and in the center you will discover the private pool. Slip into the silky waters of plunge pool or lounge out on the sun loungers as you soak up the golden sunbeams. If you want to venture outside of the villa, the beach is just across the road. The villa indulges in the beachfront location beside Alleyne’s Bay beach. Enjoy the white powdery sands and the glittering turquoise waters that span out. The panoramic views make for a great vacation picture. Walk along the soothing shoreline and listen as the waves roll onto the shore, over our sandy toes. During your stay, you can indulge in the fun and adventurous water sports activities as you explore the vibrant coral island that is nestled in the tranquil waters of the Caribbean Sea. On the West Coast, where Footprints Cottage is located, you will find an abundance of beaches that stretch along a crystalized blue-green sea. Coral reefs fringe the coast and provide you with some of the best snorkeling and Scuba Diving Locations. In the evenings you can return to your peaceful villa as you unwind before dinner. You can lie back and watch the stars light up the nights sky as dinner is sizzling softly on the barbeque. Open a bottle of wine from the wine fridge and sit down to a tantalizing meal under the dining gazebo, where you can experience an authentic island lifestyle. If you don’t feel like making dinner you could head out into town for some Caribbean cuisine as there are many restaurants a short drive from the villa. 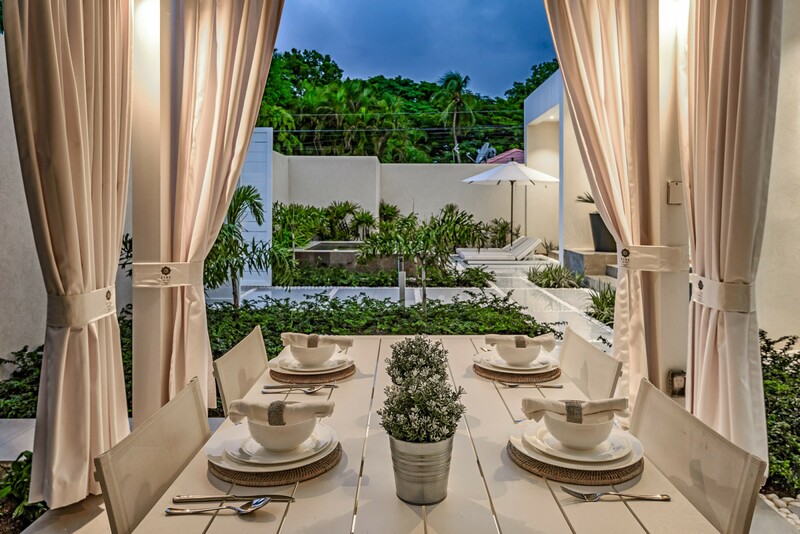 The villas interiors encompass a modern, chic design. The almost full white interiors create a pristine and neutral ambiance, which is laced with artwork and contemporary fittings. The main living area enjoys access into the courtyard, filling the room with light and the warmth of the Caribbean. 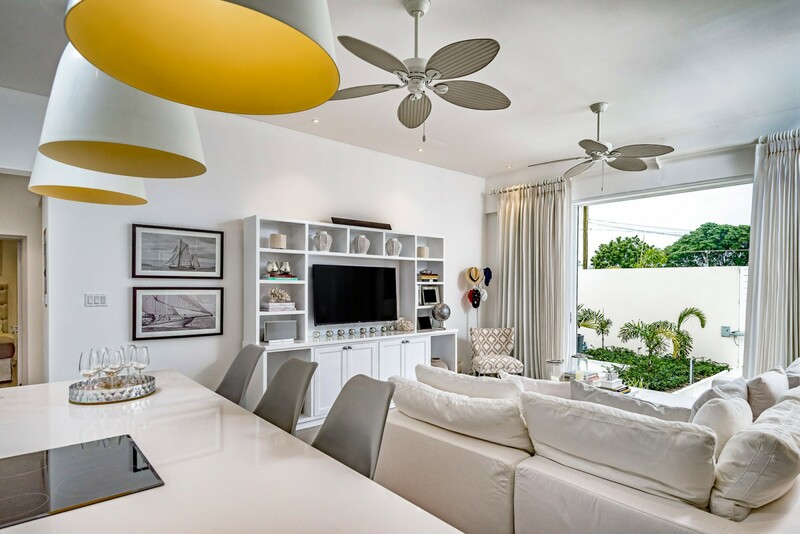 The living room sits under two ceiling fans, keeping the room cool and fresh. The large L shaped sofa sits opposite a high-resolution TV. 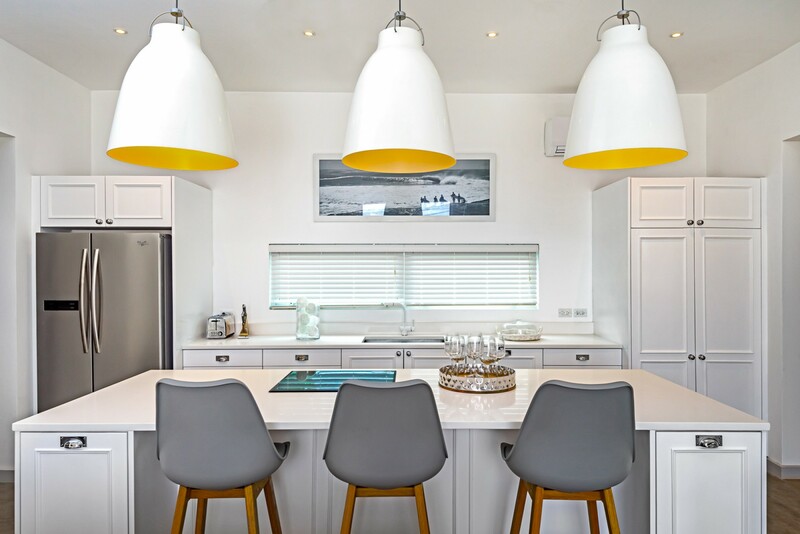 In the fully equipped kitchen there is a large breakfast bar which seats three guests. The smooth countertops and pristine cabinetry add to the modern vibe of the space. This main living area is also equipped with a security system sound systems, Wi-Fi and laundry facilities. The luxurious Footprints Cottage has a total of 3 bedrooms and 2 bathrooms. Each room is designed with modern furnishings, fresh linens, towels, and fitted with air-conditioning. The master suite is based on the ground floor and enjoys access out onto the enclosed garden and courtyard. The private en-suite bathroom with a large standalone rainfall shower and double vanity. The room includes a high-resolution Apple TV, a desk and a safe. The second and third bedrooms in the villa hold a king-sized bed and two twin beds. The rooms share access to a large bathroom with a bathtub and shower combo. The king bedrooms include the additional Apple TV. If you want an 8-bedroom villa you can combine Footprints Cottage with its neighboring 5 Bedroom sister villa Footprints which is a beach front villa across the road. 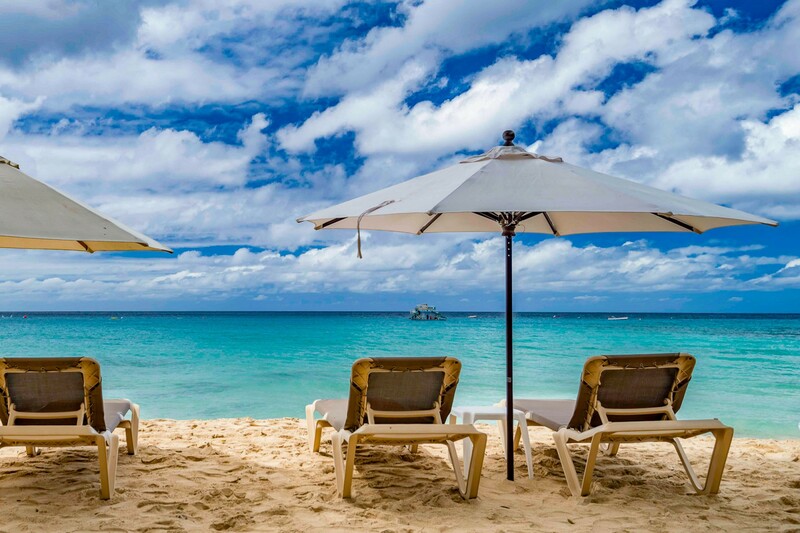 With a profusion of top-class amenities and located in a secure, tranquil location the villa provides you with all you will need to have the perfect island getaway. The tropical paradise of Footprints Cottage waits for you along Barbados’ prestigious coastline. Bedroom 1 Master: Luxurious King-sized bed, Private En-suite bathroom, Large Standalone Shower, Dual vanity, High-resolution Television, Apple TV, Air conditioning, Walk-in closet, Desk/work area, Safe, Access out into the enclosed courtyard and plunge pool. Bedroom 2: Two comfortable Twin Beds, Access to shared bathroom, Large Shower/Bathtub combo, Dual vanity, Air conditioning. Bedroom 3: Luxurious King-sized bed, Access to shared bathroom, Large Shower/Bathtub combo, Dual vanity, High-resolution Television, Apple TV, Air conditioning. Footprints Cottage is located along the sought-after west coast of Barbados. This Caribbean vacation rental is specifically based in the famous area of St James and indulges in the serene area of Alleyne’s Bay. Based in a quiet area, the villa is a short walk from Alleyne’s Bay Beach and is within range of the island’s incredible destinations. 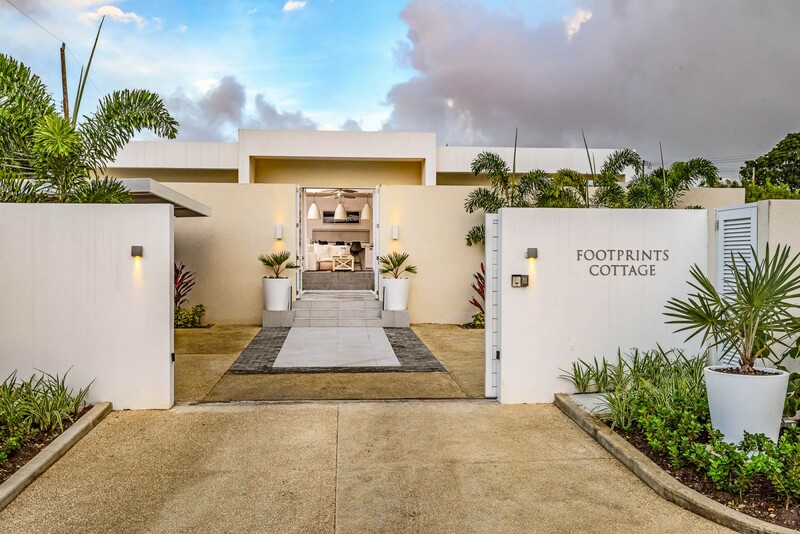 Footprints Cottage is only a minute’s stroll from the delicious and famous ‘Lonestar’ restaurant and a short five-minute drive to Holetown. Barbados is characterized by its crystalized turquoise seas, sun-soaked powdery beaches, and lush tropical landscapes. The land is graced with soft, cool breezes keeping the temperature at a very comfortable level. Barbados is popular for its vibrant and unique culture, full of fascinating people and friendly locals.